We have added buttons to share your trades directly with StockTwits, in addition to the existing buttons for Facebook and Twitter. And when you’re viewing a trade that someone else has shared, you can now share that on StockTwits as well. StockTwits has announced that starting on March 1, Twitter posts will no longer be posted to StockTwits…so be sure to use the new buttons if you want to share there! This has been one of the most frequent broker requests we’ve had, and I’m pleased to announce that Tradervue will now import trade data from OptionsHouse. To import from OptionsHouse, just go to the Tradervue import page, select OptionsHouse, and follow the instructions! 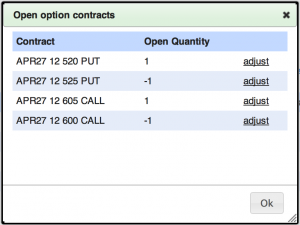 Tradervue has supported options trades for quite some time, and we’ve added support for a number of brokers and platforms that our options traders are using. Unfortunately, some of these brokers/platforms do not include data about expired options (or sometimes exercised/assigned options) in their export data, which means Tradervue has no way to know the disposition of these options. This was a real problem, and up to now the workaround was to use the Generic Import Format to put together some execution data to reflect the necessary adjustments. Time consuming and error-prone, to say the least. 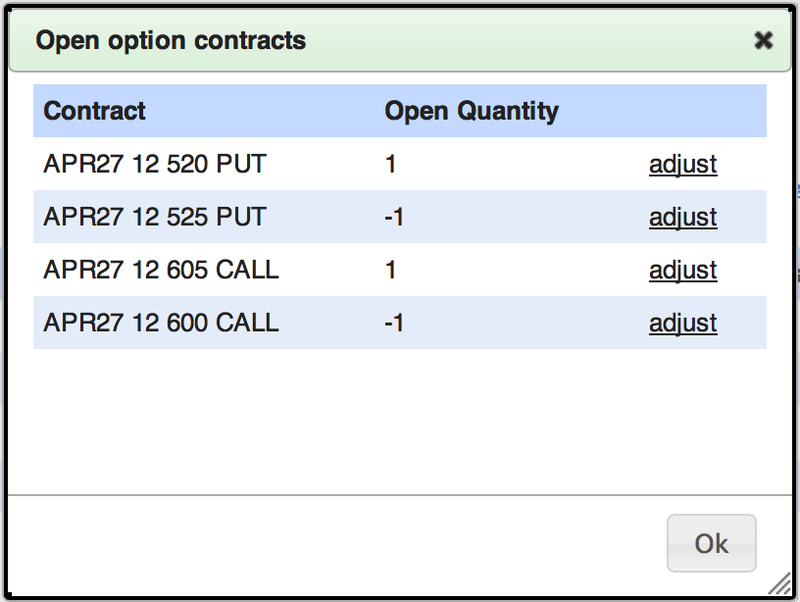 With the recent addition of the new Execution Editor, we also added a tool for managing open option contracts. To use it, open a trade in Tradervue, and click the “Advanced” link on the right side, just above the execution list. If you need to adjust any of your option legs due to expiration or any other reason, click “adjust” next to that leg. The execution editor will open, pre-filled with this contract name, and pre-filled with the quantity required to close the leg. You can edit any of the data for the execution, then save it – so to expire an option, you’d enter a price of zero, perhaps edit the date, and save. This is definitely a much easier way to manage your open option positions! Options support is available for everyone with a silver or gold subscription. For a long time now, folks have been asking if Tradervue had a way to manually add and edit execution data. Up to now, the answer has been no – generally, the premise is that automatically importing trade data is far preferable to manually entering it, and not providing an alternative led many folks to find a way to automate their process. 1. If an account was not flat at the time of the first import, Tradervue would never show correct positions; it’s easy to fix by adding one starting execution, but there wasn’t an easy way to do this. 2. For brokers and clearing firms that don’t update commission and fee data until sometime after the close, it was difficult to reconcile this with trade data already imported. 3. For brokers that don’t report expired options in their export data, users would have to use the Generic Import Format to close their expired options. Click the “add” button (on the top right) to add a new execution to the trade, and use the pencil and trash buttons to edit or delete an execution, respectively. If you’re so inclined, and you have no other way to import your trading data, it is now possible to manually enter all of your trading data into Tradervue. The execution editor is available now for all users! Tradervue now supports importing trade data from Goldman Sachs REDIPlus – just go to the import page, select REDIPlus, and follow the instructions! As always, refer to our list of supported brokers and platforms, and let us know if your platform is not on the list. If you use your personalized link to refer a friend who signs up for a silver or gold subscription, they will get $10 off their first month, and you’ll get a $10 credit off your next bill!